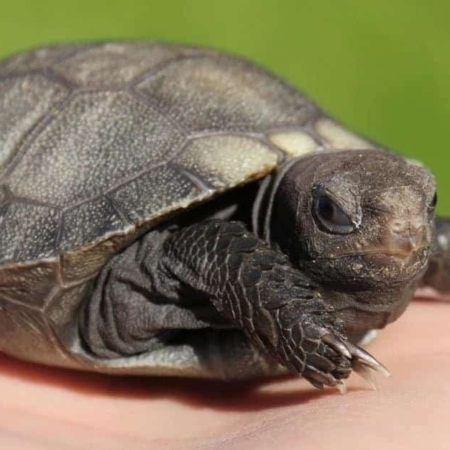 Buy burmese mountain tortoises for sale online from a true burmese mountain tortoise breeder. The Burmese Mountain Tortoise is generally considered the fourth largest land tortoise in the world. It is second in size only to Geochelone sulcata (African Spurred Tortoise) among the mainland tortoises, reaching maximum weights of close to 100 lbs. The phayerei subspecies is generally considered to be the larger, with emys emys usually only reaching ½ the size of their relatives. The emys subspecies is also called the Burmese Brown Tortoise while the phayerei is called the Black. Both have also been called the six-footed (legged) tortoise due to the very large and pointed tubercular scales on the rear thighs. Youngsters are often very shy, emerging from hiding only to eat, but as they grow (and they grow very quickly) larger specimens show a great deal of curiosity and will often approach to see what you are doing in their yard. If no food is offered, they may well try a tentative bite or nip to see if a finger or toe is tasty. Watch out, they can bite very hard!